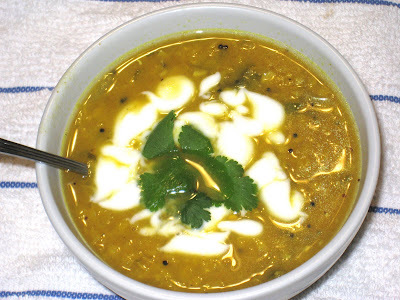 Back in December 2005 I wrote about this delicious Curried Red Lentil Soup. I made it a couple of times and then forgot all about it. Since it has been such a cold winter here in Chicago, I found myself digging deeper into my collection of warm, hearty dishes that could help take off the chill, and I ran into this gem. It's a simple soup that doesn't take long to make and doesn't have that many ingredients, but it packs a powerhouse of flavor. When I wrote about it back in '05, I had cut the amount of curry from two tablespoons to two teaspoons. I had forgotten about that when I made it this time, and it tasted much better to me this time than last time. And there's something about the popped mustard seeds that takes it over the top. I love all lentils, but I especially love how red lentils disintegrate into whatever liquid in which they are cooked. They turn from a pretty orange-pink into a golden, almost glowing, yellow. Of course the curry powder helps that transition. I did not make my own curry powder, although I do usually like to toast and grind my own spices. These days I just do not have the time nor, to be honest, the inclination. Instead, I use the sweet curry powder that is put together by my friends at The Spice House. If you're not going to take the trouble to make your own, I would recommend taking the trouble to find a good one. If that turns out to be one of the more commercial brands' versions, fine. But there are many different kinds of curry blends out there and I think it is worth exploring them. Some are sweeter, some spicier, some hotter. Each one brings its own personality to the party and I like to use different ones for different dishes. You may be tempted to omit the popped mustard seeds from this recipe. Don't. They are what makes this dish and it will not be the same without them. If you do leave them out, don't blame me if you don't like it. And don't say I didn't warn you. In a small saucepan with a lid, heat vegetable oil with the mustard seeds. Cover pot; cook for approximately four minutes, or until popping sound stops. In large soup pot, cook onion, ginger, garlic and jalapeno in oil. Add curry powder and cook 2 more minutes. Stir in lentils, stock, salt and pepper. Bring to a boil, reduce heat and simmer until soft, approximately one hour, stirring occasionally. Using potato masher, partially mash the lentils to thicken the soup.